This guide help you get a single, licensed instance of InterSystems IRIS™ running on your desktop or virtual machine. This instance is ideal for you to try out the technologies described in our First Look guides. We’ve provided instructions for 64-bit Windows 10, Red Hat Enterprise Linux 7, and Apple macOS 10.13. InterSystems Cloud Manager (ICM) provides a simple, intuitive way to provision cloud or virtual infrastructure and deploy the desired InterSystems IRIS architecture on that infrastructure, along with other services. Do not use this guide to install a production instance or for any custom installation configurations; for help with those tasks, see the InterSystems Cloud Manager Guide or the Installation Guide. Full administrator or sudo rights on your machine. Access to a single-file executable installation kit (Windows) or tarball (Linux and macOS) for InterSystems IRIS. A valid license key for InterSystems IRIS in an accessible folder or directory, typically named iris.key. The First Look you are working with may have specific requirements for an installation; for example, Normal security may be required. Make sure to review the Before You Begin sections of the First Look before you follow the directions below. After you have installed InterSystems IRIS, you can find procedures for connecting your Integrated Development Environment to the instance in InterSystems IRIS Basics: Connecting an IDE. 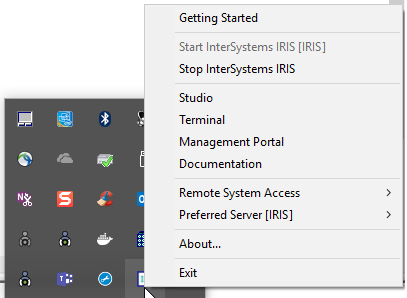 In Windows Explorer, right-click the InterSystems IRIS installation executable and select Run as administrator. Click Yes in the resulting Windows user account control dialog. If a Select instance dialog appears, choose New Instance. In the InterSystems IRIS Instance Name dialog, enter a name for your instance of InterSystems IRIS, using only alphanumeric characters and underscores. Then click Next. If the displayed destination folder for the installation is acceptable, click Next. If not, click Change to choose a different folder. Use a folder on your machine, not a mapped network drive. In the Setup Type dialog, accept the default of Development and click Next. In the Initial Security Settings dialog, choose the security type recommended by your First Look. If none is recommended, accept the default of Minimal and click Next. (Normal and Locked Down security only) In the Enter Credentials dialog, choose Run InterSystems IRIS under a defined Username account, confirm that your Windows username and domain are correct, and enter your Windows password. Then click Next. (Normal and Locked Down security only) In the InterSystems IRIS Users configuration dialog, enter and re-enter a password of 832 characters (alphanumeric and punctuation allowed). Make note of this password, since you will use it when you log into the main InterSystems IRIS management tools. Then click Next. (Normal and Locked Down security only) For Enter password for CSPSystem account, enter and re-enter a password of 832 characters (alphanumeric and punctuation allowed). Make note of this password. Then click Next. In the Ready to Install the Program dialog, click License. Navigate to your license key file and choose it. Then click Install. The installation process takes a few minutes. For access to your new installation, right-click the up arrow in the Task Bar. You should see a menu of icons. The InterSystems IRIS icon looks like this and if you right-click it, you’ll see a list of management tools for the instance. Create a group within Linux and add your user account to it. Extract the installation files from the tarball. Go to the directory to which you extracted the installation files. Run the command sudo ./irisinstall, which issues a series of prompts. If you are prompted to enter a number for your platform, enter the number listed for Red Hat Enterprise Linux. For Enter instance name, enter a descriptive name for your instance. Use only alphanumeric characters and underscores. Confirm the instance name by pressing Enter. For Enter a destination directory for the new instance, enter the name of the directory for the InterSystems IRIS system files. Do not use a symlink. The directory need not exist yet on your machine. Confirm that you want to create the new directory (or use the existing directory you entered) by pressing Enter. For Setup type <1>, press Enter to accept the default installation type (Development). For Initial Security settings, enter the number for the security type recommended by your First Look. If none is recommended, press Enter to accept the default of 1 (Minimal). (Normal and Locked Down security only) For Which user should be the owner of this instance? enter the name of your user account. (Normal and Locked Down security only) For Please enter the common password for _SYSTEM...", enter (and then re-enter) a password of 832 characters (alphanumeric and punctuation allowed). Make note of this password, since you will use it when you log into the main InterSystems IRIS management tools. (Normal and Locked Down security only) For Please enter the common password for CSPSystem...", enter (and then re-enter) a password of 832 characters (alphanumeric and punctuation allowed). Make note of this password. For What group should be allowed to start and stop this instance?, enter the name of the group you created in step 1 above. For Do you want to enter a license key, enter y. Then enter the full pathname of your license key (for example, /home/user/iris/iris.key). The script displays the installation options you’ve chosen before proceeding. Press Enter to accept the choices. Take note of the URL displayed at the end of the installation script’s output: it is the URL for the Management Portal, which is the system administration user interface for InterSystems IRIS. To check the status of and see other information about your newly installed instance, enter iris list. Create a group within macOS and add your user account to it. If you are prompted to enter a number for your platform, enter the number listed for macOS. (Normal and Locked Down security only) For Please enter the common password for _SYSTEM...", enter (and then re-enter) an alphanumeric password. Make note of this password, since you will use it when you log into the main InterSystems IRIS management tools. (Normal and Locked Down security only) For Please enter the common password for CSPSystem...", enter (and then re-enter) an alphanumeric password. Make note of this password.